This is the next project that I have been working on for a while now. 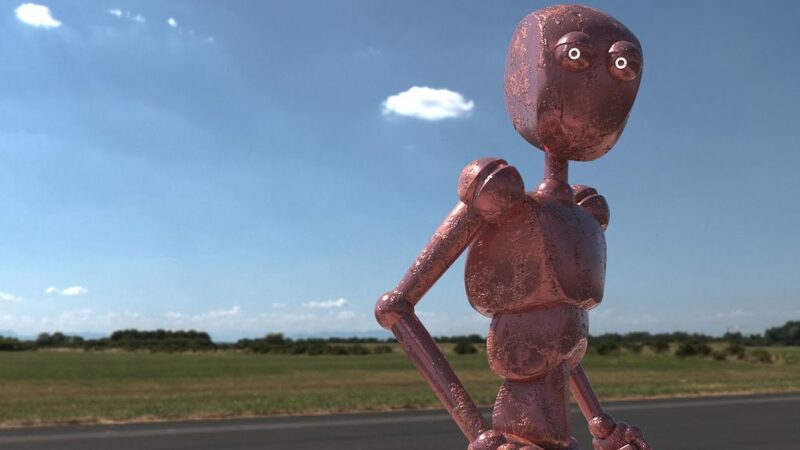 The robot you see in the background is a standard asset in Houdini. The simple biped asset is a really simple example of a rig. I saw an opportunity to turn something this simple into something that looks nice. 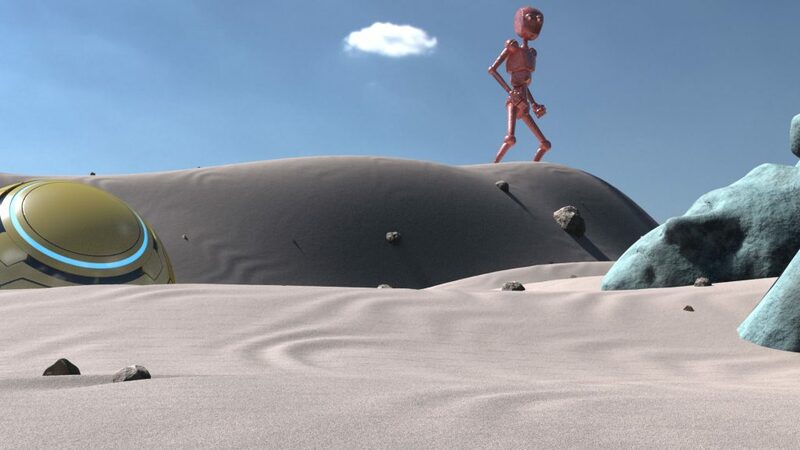 The biped is animated and walks along the dunes of this desert when something unexpected happens. I love these desert shots because I have seen several full cgi shots which have very interesting sand and dune looks. The challenge for me is to get the physics and feel of the sand right. There is the fine sand that blows off the top of the dune in the back where the bipad is walking on. Also there should be sand shifting closely to the surface too, since the sand particles are so light they get picked up by the wind. And of course something interesting has to happen to the orb. The orb you see on the left side is something that I have created earlier. Do you recognize where it is from? The title might give it away. I was trying to get into sand and grains and quickly discovered how hard it is to get control of direction. The orb smashing down was animated and not dynamic, the particles do however react to this impact. I was not satisfied with the sands physics, they seemed to explode in the beginning. Since I had so much trouble doing this sim the correct way ( and I can’t find a lot of information on it) I changed this scene a bit. I am going to include a explosion instead, stay tuned. Going through several iterations of this shot I am finally coming closer and closer to the final product. I changed the scene to where the Orb has become the central focus in this scene. So far I also removed the robot to avoid divided attention to the shot. Maybe I’ll implement him later, not sure. As you can see the orb is now rolling through the landscape and have done several simulations to get to this point. The landscape deforming is a SOP simulation. 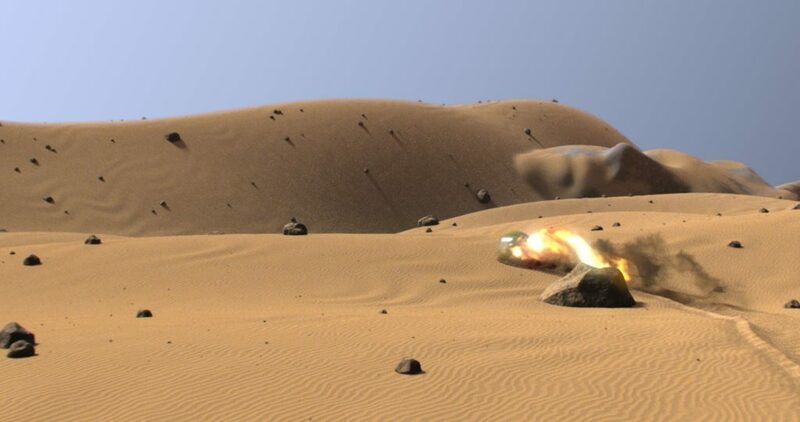 The particles (sand) at the back of the orb are two layered particle simulations and on top of that there is going to be a pyro simulation to add the dusty effect. I added more waves to the sand because when you look at desert shots (dependent on which one of course) you see these waves created by the wind. I added those with bump, procedural of course. The scene also contains fire! Halfway through the scene the orb catches fire and will explode once it rolls over the hill. I’m expecting this scene to be finished within now and two weeks.